I don’t enjoy crowing – but I am so fed up of living in a state where corruption on a truly massive scale is simply taken for granted, something that is so normal as to rarely warrant a mention in everyday life, that I am overjoyed to bring you the news that our last Prime Minister is now awaiting trial in Evora Prison on charges of corruption, money laundering and tax evasion. 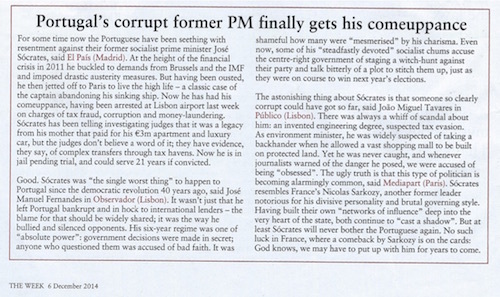 The article above is from The Week, (a newspaper that I endorse as being bias-free, enjoyable to read, interesting and informative, and a subscriber to which I have been ever since its inception), and it pretty much sums it up – apart from some lovely intercepted phone call quotes along the lines of, “I’m far too big a fish for them to catch – they wont have the balls to try to get me”. This is the man that until a few years ago was the leader of our country. Following on from the latest bank failure where it was just the same, all buddies “loaning” each other cash that wasn’t theirs and truly believing that if they had all their own wealth in their family members’ names they could never get caught, it is a welcome piece of good news when a courageous judge goes for the very highest. We await the fall-out and hope against hope that it is the start of a new story for this beautiful land. Another piece of good news – apart from the awards that we’ve been given this year by Tripadvisor that I’ve mentioned before – is last week’s article in The Telegraph where the Quinta is chosen to be one of the top 5 Activity Holidays in Portugal. Happy New Year to you all and I hope we see more than our fair share of you this coming year!